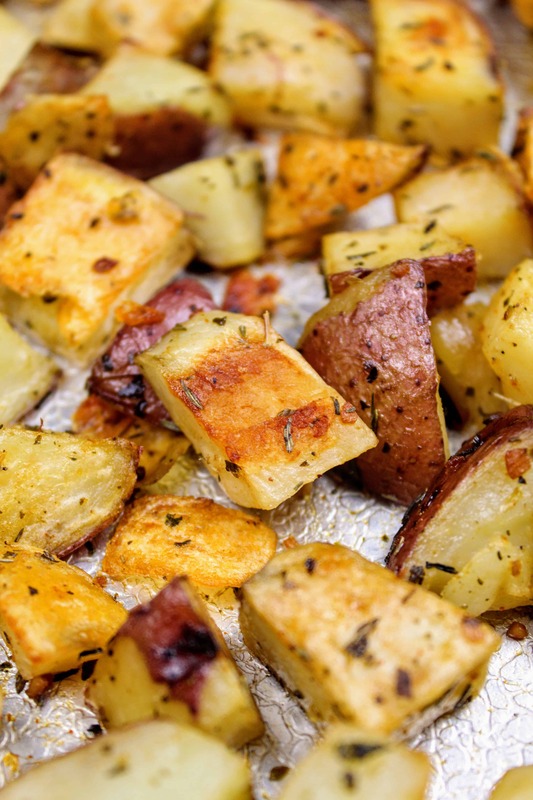 Yes, red potatoes are great for roasting! You can roast them with the skins on or off. I prefer to leave the skins on when roasting, because not only is the prep work easier, but you get additional nutrition from the potato skins. Is it safe to eat potato skin? Yes, it is generally safe to eat potato skins. Potato skins not only contain nutrition, but they add more flavor to your dish. However, there are some cases when the skin should be removed. Potatoes with visible insect damage, blackened areas, green areas, or surface mold, should have these sections removed prior to cooking. For a more thorough discussion on what to look for and how to properly prepare your potatoes in these cases, please check out this article. 1. Preheat oven to 400F. Prep your red potatoes by scrubbing them and drying them thoroughly. Cut them into ~1 inch cubes and transfer them to a baking sheet. In a small bowl, combine garlic, basil, thyme, oregano, smoked paprika, salt, pepper, and extra light olive oil. Mix until combined. 2. Drizzle the herb oil mixture over the potatoes on the baking sheet. Toss the potatoes with your hands until the potatoes are evenly coated. Spread the potatoes out in a single layer on the baking sheet. 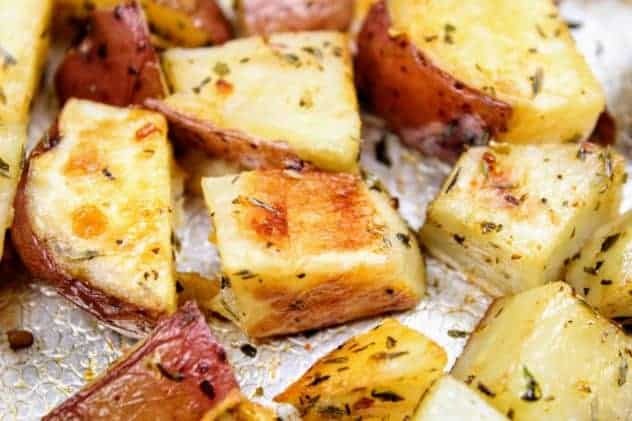 Bake for 45-60 minutes, or until potatoes are golden brown, removing the baking sheet from the oven and stirring the potatoes every 15 minutes. 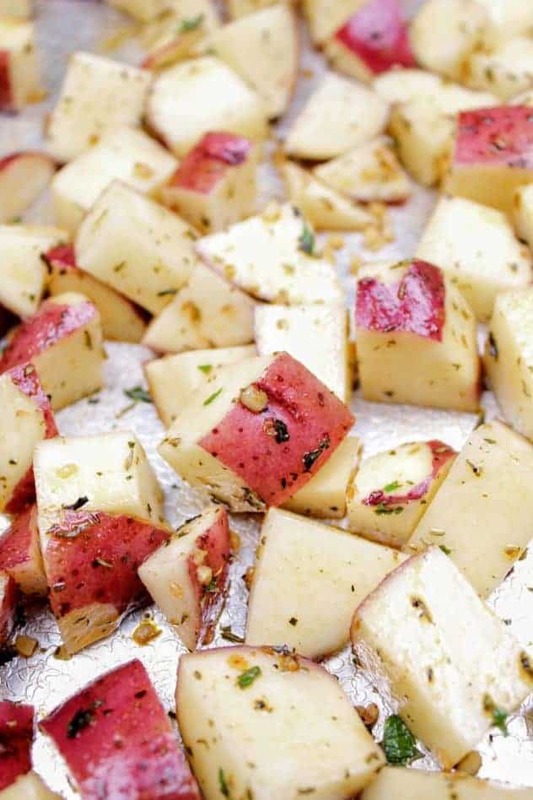 These Roasted Herb Red Potatoes make a great side for practically any main dish! They take only a few minutes to prepare, and then you pop them into the oven and forget about them while you finish making the rest of your dinner. While oven is preheating, cut potatoes into ~1 inch chunks and transfer to a baking sheet. In a small bowl, combine garlic, basil, thyme, oregano, smoked paprika, salt, pepper, and olive oil. Mix until combined. 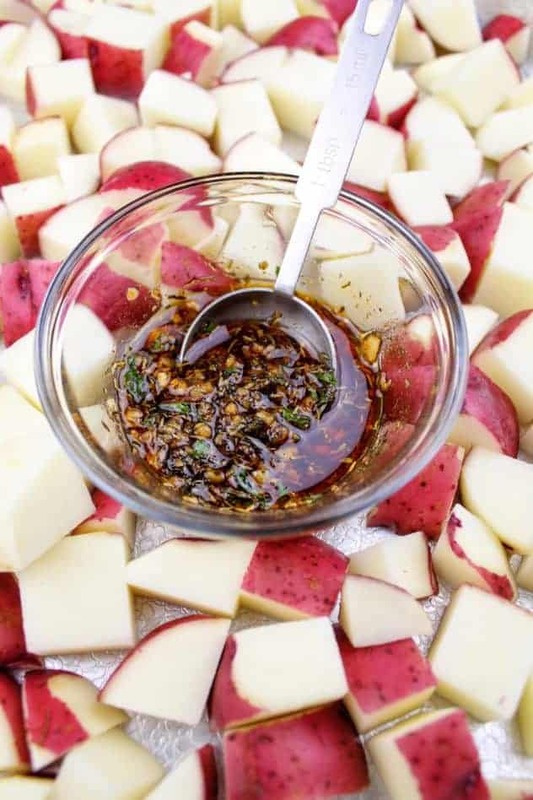 Drizzle herb oil mixture over the potatoes, and stir until they are uniformly coated. Bake for 45-60 minutes, until the potatoes are golden brown, stirring every 15 minutes with a spatula. If desired, top potatoes with fresh parsley and enjoy! The amount of smoked paprika specified in the recipe gives the potatoes a subtle smoked flavor. If you want it to be more intense, I would recommend increasing the amount to 3/4-1 teaspoon. I don’t know what red potatoes are until I saw the picture. We call that camote or sweet potato in the Philippines. Your recipe looks easy, I’ll try to follow it this weekend. I love roasters! I am a carbaholic too aha This looks so good, I can’t wait to try these. tasty!!!!!! 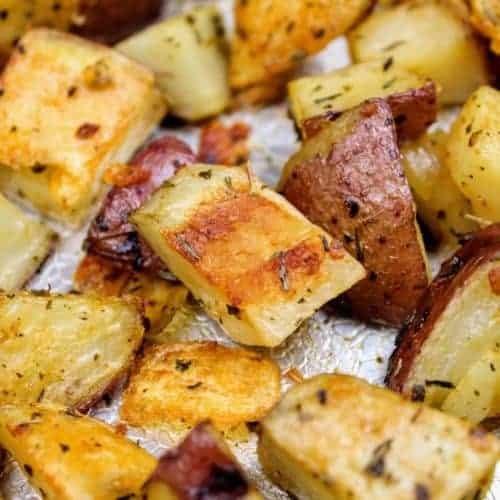 i must say roasted herb red potatoes really looks good i wish i had some in front of me right now ,thanks for the tips and ingredients i will get to try it later. 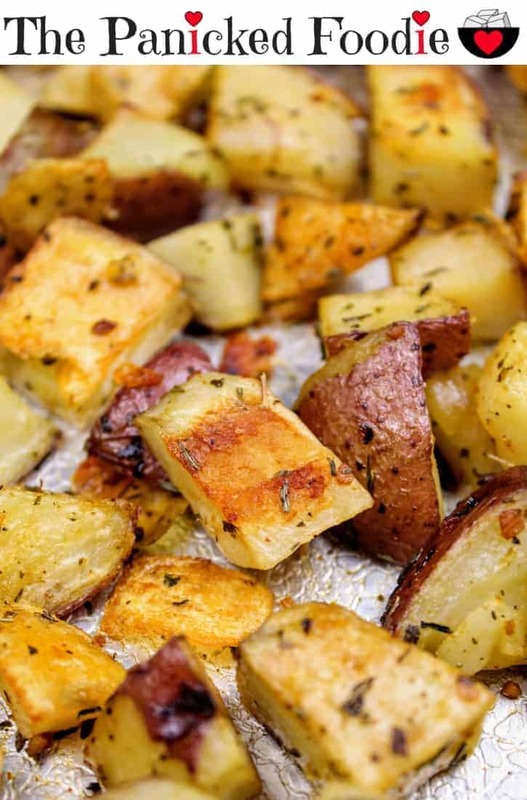 I LOVE Roasted Herb Potatoes! Living in potato country (Idaho), I get to enjoy them frequently. This is truly a great dish. You know, I’ve never eaten red potatoes before, which is totally weird, as I love potatoes. I think I will make a batch of these to go with our Sunday dinner. I’ll ttry this recipe. Looks so yummy. I’m sure my family I’ll love this. I love potato dishes. This sounds very tasty. I will be trying my hands on this recipe soon. I love red potatoes! I haven’t had them in a while. I will try this recipe soon! Roasted skin on potatoes are my favourite thing ever!! These look delicious and I love that you added herbs in to really ramp up the flavour too!